We offer a quality range of uPVC conservatories in Polegate, Brighton and East Sussex. Get Instant Conservatory Prices Using Our Online Quoting Engine. Extend your home with our beautiful uPVC conservatories in Polegate, Hailsham, Seaford, Eastbourne, Brighton and East Sussex. We offer a stunning range of uPVC conservatory styles to meet all properties and tastes so whether you are after something modern or traditional, we have the right conservatory design for you. A valued home improvement, choosing to install a conservatory is a big decision and here at Windows Xpress, we are with you every step of the way, helping you to achieve the perfect addition to your property. We make sure your conservatory matches your property style. Afterall, who wants a conservatory just bolted on the back? We will help you enhance the feeling of space and flow by installing a conservatory which complements your home’s existing style. Choosing a conservatory style and design may seem stressful but it is also exciting. What will you use your conservatory for? For many, a conservatory is an affordable means to create extra space within their homes, an extension of their dining room or family area. For others that seek more solitude, a conservatory can be a place of comfort and relaxation. Having an idea about how your conservatory will serve your lifestyle will allow you to choose the right style for your needs. This is the first step in the conservatory planning stage. Whatever your intent, our conservatory experts are at hand to help you design the perfect conservatory to suit both property and lifestyle. There are a number of conservatory styles to choose from so you won’t be left struggling for choice but which conservatory do you choose? More importantly, which uPVC conservatory style will add the most value to your home? Firstly, you need to choose a style which can accommodate for your type of property. For example, those with small gardens ought to give much thought to the shape and size of their conservatory. uPVC conservatories fall into two broad categories: modern and traditional. The first step in choosing the right conservatory for you East Sussex home, is knowing which styles are available to you. Generally modern properties benefit from contemporary styles and vice versa however, there are exception to this rule. A traditional conservatory can actually provide a touch of grandeur to the more contemporary home and you will find that it can also soften your property’s modern aesthetics. Again, period style homes are usually paired with traditional conservatories. No doubt a classic conservatory will enhance your property’s traditional charm but again, it doesn’t mean you are limited when it comes to choice. Many home owners who have period properties are inspired by the contemporary look. Sometimes a modern conservatory within a traditional home can offer a complementary balance. Our traditional uPVC conservatories are designed to complement period properties, allowing you to benefit from a modern development without compromising your property’s aesthetics. Choose from our Victorian, Edwardian, Gable and Lantern conservatory styles to maintain a traditional appearance. The traditional elegance of a uPVC Victorian conservatory makes it a very attractive choice for your home. It can be extended to a range of properties, particularly period properties. Sharp roof edges are offset by soft and rounded facets – think of an octagonal shape. Beautiful finials that line the roof add a lavish, glamorous touch. Find out more. uPVC Edwardian conservatories made a striking addition to your home. Their robust and rectangular structure is complemented by crisp clean lines. Their structure provides generous floor space and allows for lots of natural light. Their spacious interiors prove to be a particularly attractive proposition for customers looking to extend their space. Find out more. For a bold, focal statement with a touch of grandeur, choose the gable conservatory. This high-angled roof design amplifies light and space, creating a bright and warm atmosphere. The timeless elegance of a gable conservatory makes it incredibly attractive. The gable-ended conservatory often incorporates a ‘rising-sun’ design, a stylish and charming roofline feature. Find out more. Popular and cost-effective, the uPVC lean-to conservatory is practical and affordable. 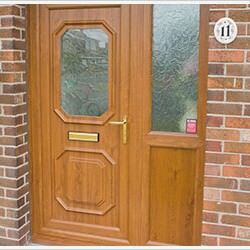 Ideal if you have limited space this versatile design can be made to fit your property requirements. This highly adaptable design is perfect for bungalows, terraced houses or any property with low eaves. Simple yet beautifully understated, the lean-to offers a stylish, clean and contemporary design. Find out more. These conservatories combine a lean-to conservatory with another conservatory style to create a P-shaped structure. This dual purpose conservatory offers an elongated design ideal for those with bigger properties. These tailor made conservatories are also perfect if you have an unconventional building space. Find out more. Ideal for larger properties, lantern conservatories are a combination of designs such as the Victorian or Gable, creating a truly bespoke design. This style gives you the advantage of two living areas due to its extra size. Providing a feeling of great height they offer a large and majestic glass roof, giving you unhindered roofline views. Find out More. Complete your conservatory look with our elegant range of finials and crestings. Our conservatories can be installed with a stylish range of decorative trims which allow you to personalise your conservatory. We offer decorative trim and decorative eaves beam trim as well as other contemporary and traditional designs. We have options to suite every style and taste. Our decorative trims are positioned where the roof meets the window frames and are available in a wide variety of designs and colours to complement your choice of conservatory colours. The size, colour and style of your conservatory is important but so is the glazing. Choose from a range of polycarbonate options or opt for our market leading product: Celsius High Performance Conservatory Glass. Windows Xpress offer unrivalled conservatory prices in East Sussex. Based in Polegate, our local conservatory company has been installing beautiful conservatories for many years in and around the East Sussex area. Call us today for a free, no obligation quote, speak to one of our conservatory experts on: 01323 488729. Get instant conservatory prices for all your favourite styles using our conservatory cost calculator. Browse through a multitude of designs and get a free, instant cost. 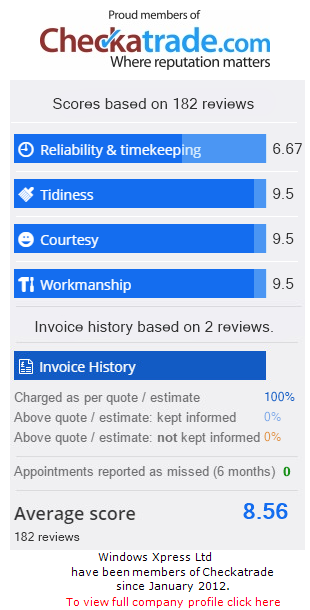 Tailored to your requirements, your quote gives you a unique conservatory cost. 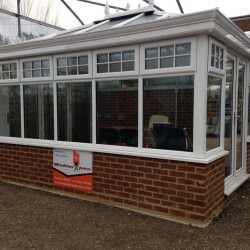 See our conservatory prices in East Sussex.